Vehicle parking and revenue control systems are commonly referred to with the acronym PARCS. Other phrases used to describe these systems are vehicle access control and access revenue control. 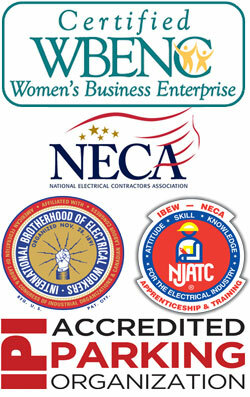 ECI does not contribute to the actual parking lot or building installation. However, we do participate in design, specification and installation of the control devices used to effectively manage the day-to-day and ongoing operation of these systems. These controls help manage access into and out of a parking facility. The facility may or may not include revenue control, have the ability to collect parking fees at the time of park, or to tally the dates and times of access and egress. For instance, a gated community, apartment complex, golf course, commercial building, business park, etc. may restrict access to residents, members or guests, but not collect parking fees. Visitors may gain access through closed circuit telephone (and or video) communications with a resident or security guard. On the other hand a municipal parking garage, hospital parking garage, etc. may collect fees from visitors, but still allow access to non-paying, permitted vehicles (doctors, staff, municipal workers, VIPs, etc.). Some users pay on a daily or hourly basis which is classified as short term users. Others use permits or credentials to allow access on a regular, or long term basis (i.e. for one month or as long as employed, while a resident, for a school session, etc.). Vehicle access control systems are generally composed of many parts which may or may not include: gate operators and barriers to control access to the facility; ticket spitters which dispense a time stamped ticket; payment terminals, cashier booths, pay-on-foot (automated pay) stations; keypads and card readers; telephone entry systems, intercoms and video systems; validation systems, vehicle detector loops, as well as bollards to protect sensitive and expensive equipment. ECI sells and installs Automatic Vehicle Identification systems (AVI) which include hands free windshield and license plate tags which are in actuality an electronic permit. These tags identify vehicles authorized to access the facility on a regular and/or scheduled basis. The technology is based on Radio-Frequency Identification (RFID). A vehicle’s tag may be authorized for 24/7 access or limited to a schedule. The vehicle is granted access when the tag is read and access is allowed at that time. A log of entries and exits may be kept in a computer data base. Proximity cards or magnetic strip cards can likewise be used. 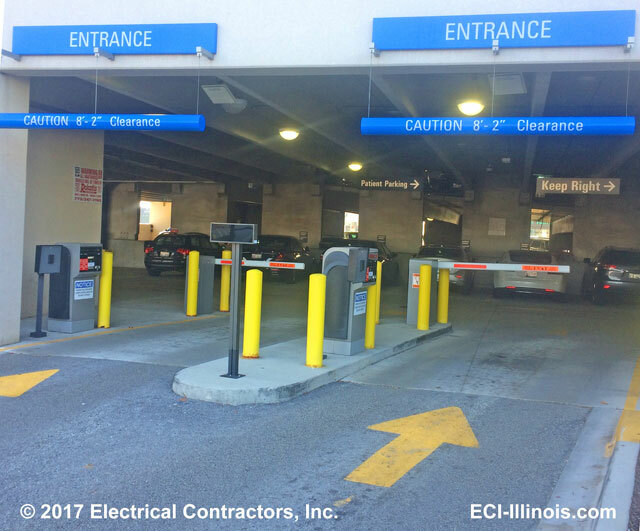 Call ECI-Illinois at 847.949.0134 for your site planning or site inspection, assessment and suggested applications for your particular requirements, revenue control application or safety and security protection.